AutPress! New Submission Guidelines! Book Bundles and Discount Deals! When I was first approached to become a partner of Autonomous Press earlier this year, my partner Solomon and I felt both happiness and amazement. Together, we’d been editing and publishing Barking Sycamores for almost two years, and when we discussed the offer, it made sense for us to join the AutPress family. That was about eight months ago. Now as a partner and the Coordinating Editor of NeuroQueer Books, I’m excited about the new direction AP is taking with its focus on transformative work by neurodivergent authors as well as featuring the voices of marginalized peoples. (By the way, we’ve recently retooled our submission guidelines.) 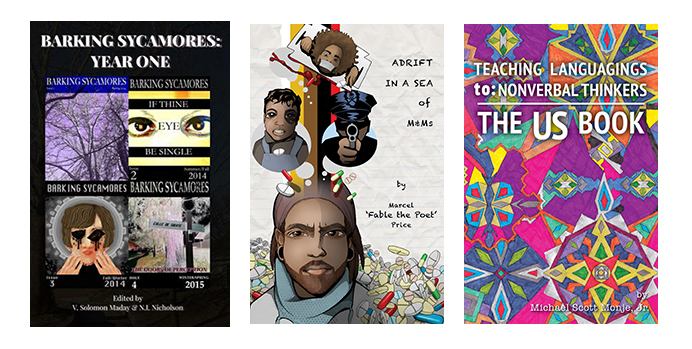 Additionally, we strive to bring readers a collection of “books that wake people up”—and that includes some of our bundles and discount deals, all of which come in paperback and ebook formats. AutPress’ Autistic Activist Bundle contains three excellent introductory texts about the lived experiences of Autistic people. The ABCs of Autism Acceptance by Sparrow R. Jones is a book of essays first appearing on his popular blog Unstrange Mind, seeking to change the ways in which autism is perceived. Also in this gift bundle is Typed Words Loud Voices, featuring work by several writers who type to communicate. Finally, The Real Experts is one of the press’ top sellers, full of insider wisdom about autism written by Autistic adults. The second of AutPress’ bundles and discount deals is Shaping Clay: The Elementary Trilogy. 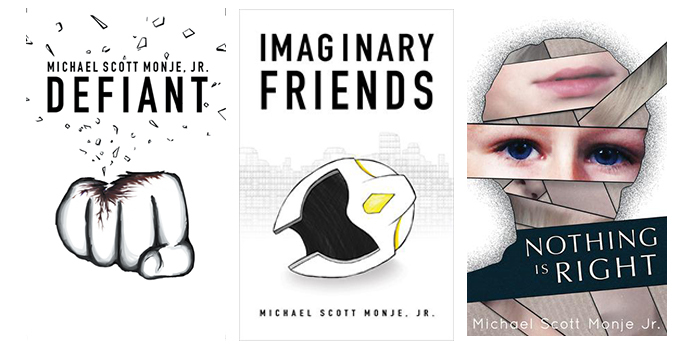 This package bundles together the three books released to date in the Shaping Clay series: Nothing is Right, the Lambda Literary Finalist title Defiant, and the epic Imaginary Friends. If you haven’t read Clay Dillon’s saga, start with this gift bundle of books. And since Michael promises that “things are about to get weird” with her next release Gaslight Village, so you’ll want to buy the Shaping Clay trilogy now to catch up on the story. To support Gaslight Village and read it as a serial subscriber, visit Michael’s Patreon. Poetry fans looking for bundles and discount deals are going to want Autonomous Press’ NeuroQueer Poetry Bundle, which has all three poetry releases from NeuroQueer Books at a substantial discount. This gift bundle includes Barking Sycamores: Year One was edited by me and Solomon, and is a collection of the poetry, short fic and artwork originally appearing online in our debut year of publication. Also included is The US Book by Michael Scott Monje, Jr., which provides the backstory for both Clay Dillon’s and Lynn Vargas’ universes. Finally, Adrift in a Sea of M&Ms, the Summer 2016 collection released by Michigan spoken-word artist and activist Fable the Poet. And…as one of our bundles and discount deals, we’ve added the NeuroQueer Horizons bundle. This is a collection intending to center neuroqueer voices, and it’s a great place to start with our NQ material prior to the launch of the NeuroQueer Horizons chapbook series. 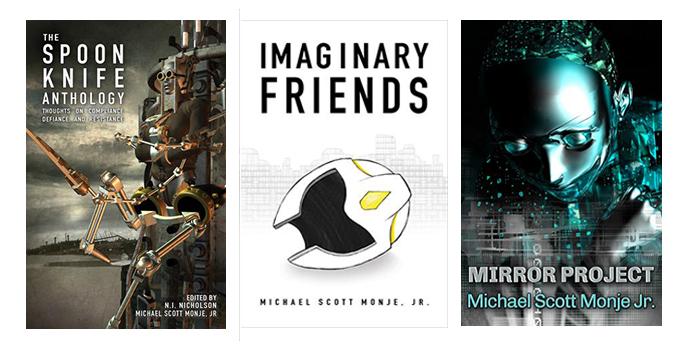 This roundup of neuroqueer-written fiction, memoir, and poetry contains the first Spoon Knife anthology, the science fiction thriller Mirror Project, and Monje’s Imaginary Friends, a surreal exploration of Clay Dillon’s childhood from the Shaping Clay series. I’m really excited about these gift bundles, and I think they’re perfect for gift-giving as well as snagging for your own reading. These are all generously discounted, so if you’re budget-conscious you can easily pick up the ebook versions for yourself. Or if you want to beef up a friend’s personal or academic library, these collections are ideal. We’re gearing up for a series of new releases in 2017 (probably including my own poetry book Time Travel in a Closet—stay tuned for that! ), so grab our bundles now and start your collection!